Check out the trailer below for our new product, the Tachyon XC Extreme Action Cam; which will be available in Early September. Check it out! 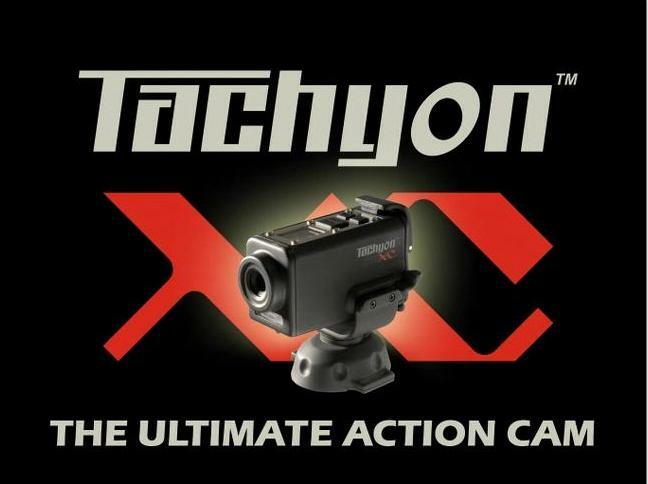 The Tachyon XC, The Ultimate Action Cam! The Tachyon XC – Extreme Helmet Camera is the latest generation video and still camera designed for filming extreme action. It is extremely rugged and very simple to use, while delivering up to a full 30FPS of VGA video. It comes with a remote control and custom-designed mounting accessories. It makes use of the common 1, 2, and 4GB SD and SDHC cards, but it is also the only helmet cam on the market that is compatible with the 8GB SDHC card. This can give the user up to 16 hours of video on a single card. A patented shock-proof battery system eliminates a common problem among other helmet cameras; the loss of power and recorded files caused by the jarring loose of the batteries. This innovation ensures that videos taken in challenging and perhaps impossible-to-repeat situations will not be lost. And unlike other cameras which need to rely on an external waterproof case, the Tachyon XC’s housing is already waterproof, allowing you to film to a depth of 8 meters (28.5 feet) and protecting the camera from the elements. Visit http://www.tachyoninc.com for more information and for ordering the ultimate helmet cam!